Doesnt matter where you live. Everybody wants to have a lovely looking lawn. Clean edges, green and healthy grass, and neatly trimmed trees. If you’ve taken care of your landscape, don’t allow it to be hidden just because the sun went down. 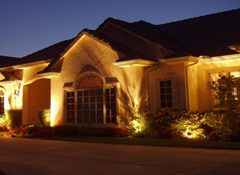 Highlight your building and your lawn with exterior lighting installation in Port Washington, NY. We specialize exclusively in outside lighting installation for residential and commercial properties. Our designs are based on your property layout, needs, wants, and budget. See our comprehensive list of landscape lighting services. We’ve got a bright idea! Cut out the middleman and go directly to the source for landscape lighting solutions. Just Landscape Lighting deals directly with the manufacturer, allowing us to buy in bulk and provide our clients with the best prices around. Our goal is to save you time and money while you receive customized exterior light services that transform your home or business. In addition to our affordable prices, we offer a lifetime guarantee with our products and services. Spruce up your yard the affordable way with a trusted exterior lighting contractor. For more than 20 years, residential and commercial customers throughout the area have depended on us to provide bright solutions for their lighting needs. Reach out to us today to schedule a free, in-home consultation. You wouldn't call a stonemason to fix your water heater, and you wouldn't call an electrician to install your roof. Why call anyone but an exterior lighting contractor to handle your outdoor lighting design and installation? Since 1996, Just Landscape Lighting has been Long Island’s most recognized and trusted low-voltage landscape lighting company, continuously providing customers with high-quality products and personalized service. Our quality of workmanship has also been recognized by CAST Lighting with a Certificate of Excellence in Landscape Lighting and Design. Our customers always enjoy customized services when they depend on our company. We are very flexible when it comes to putting together a design you can feel good about. Nothing is set in stone, so our job is not complete until you are 100% satisfied. We are so confident in our work that you won't pay a dime until we are finished with your project. Our primary objective is to make our clients feel they received the best deal possible for their yard and that they called the best company for the job. Contact us to schedule a free estimate and consultation if you want exterior lighting on your property. We proudly serve customers throughout Port Washington, NY, as well as Long Island. Monday – Saturday, 7 a.m. – 6 p.m.